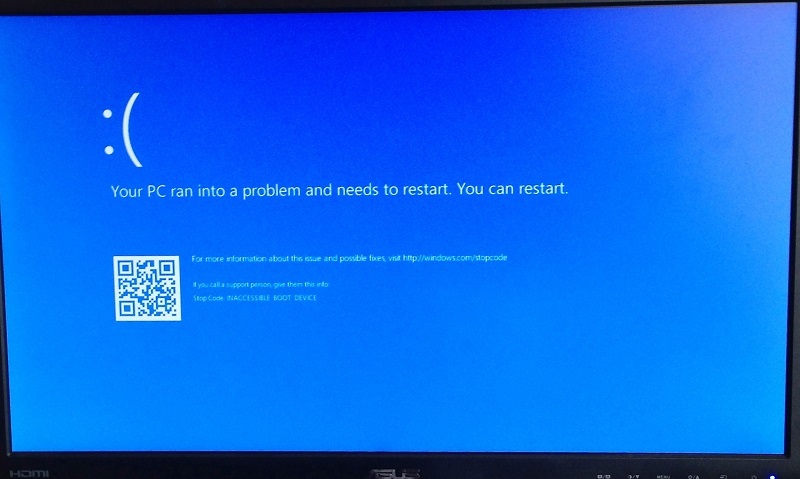 If you have an E2B USB hard disk and you want to install Windows onto a UEFI-system, it can be a bit of a pain the make the .imgPTN file and get it working. Especially if you want to use SDI_CHOCO. However, you can install Windows from an E2B USB drive using WinNTSetup by JFX. This way you do not need to modify the ISO or create a .imgPTN file or modify the boot.wim files, etc. to perform a UEFI\GPT installation. Also a WinHelper USB Flash drive is not required. This means you can boot from a Win8/10 Windows Install or WinPE ISO and then use WinNTSetup to install Windows from any ISO on the E2B drive. There are many videos on YouTube about WinNTSetup, if you want to see it in action. You can even boot to one of the DLC WinPE ISOs which already contains WinNTSetup, instead of booting from a Windows Install ISO. Tip: JFX has revised v3.8.7 Beta 4 so that you can run diskpart scripts using CTRL+SHIFT+D (see tools\diskpart folder). For instructions see the WinNTSetup page on the E2B site here. Kevin asked me how to add persistence for Parrot linux. Parrot speaks to you when it loads! Since this is based on Ubuntu, I simply modified the Ubuntu_2016_Persistence.mnu file. I have added a copy of Parrot_3.1.1_Persistent.mnu to the Alternate Downloads Area - mnu files - linux folder, if you want it. In case anyone is still living in the Stone Age and is using QEMU to test their bootable USB drives, this is just a short blog to make sure you are aware of DavidB's utility VMUB (Virtual Machine USB Booter) for use with Oracle Virtual Box. I wrote a previous blog about it here. There is also a YouTube video. I use VMUB all the time because it is much quicker than using QEMU and it can boot a variety of different Virtual Machines (including MBR 64-bit, UEFI 32-bit and 64-bit booting). The VMUB utility gives much better results than using a manually created .vmdk file for your USB drive because VMUB also dismounts the USB drive before running VBOX. This eliminates some of the problems that you get when using a simple .vmdk file with VBOX. Bugfix for grub4dos so does not absorb key presses before menu is displayed. Warning message if try to use .imz file extension (you need to convert to .ima). Added sample .mnu files for Remix OS x86 with persistence (thanks Sergio!). Small changes to German language files (thanks Frettt). Add fmt_ntfs.sh script and udefrag utility to docs\linux_utils folder - can now make and maintain an NTFS E2B drive under linux. Update FreeDOS floppy image to allow access to NTFS files under FreeDOS (E2B drive = C: ). Available on website or Alternate Download Areas. Version 1.83d is a 'Release Candidate'. Please let me know if you spot any issues ASAP. I will probably release it as v1.83 release version in a few days. Many years ago when fingerprint sensors first started to appear on the market, it seemed a really useful security feature. The company I worked for (RM plc) made PCs, notebooks and tablets for schools. The use of passwords was a common problem in schools. The password needed to be long enough and complex enough to be secure, but also easy to remember. Also, the crafty kids would often watch a teacher type in their password and so learn their admin password. The kids would also forget their passwords, which meant that teachers or the IT admin guys were constantly having to reset their passwords and create new ones for them. Kids would write down their password and other kids could find them and copy their homework, etc. Passwords were a real headache. So fingerprint scanners seemed to present an ideal solution and as everyone's fingerprint is unique - so it is foolproof, right? I have updated RMPrepUSB to use the new version of mke2fs. It now asks you to specify ext2, ext3 or ext4 format when you use the Create Ext2/3/4 FS button. This makes it more convenient to create ext3 or ext4 files. I will remove the mke2fs files from Easy2Boot as there is no need for them now. For persistence files with E2B, I recommend ext3 because ext2 files can become easily corrupted. I suggest you avoid ext4 because grub4dos may not be fully compatible with ext4 and I don't think there is much advantage over ext3 (but I might be wrong!). Add sample .mnu files for Remix OS x86 with persistence (thanks Sergio!). Note that I have discovered (thanks to a post by Shiv Manas on Google+) that the udefrag linux utility will make files on an E2B USB drive contiguous (provided you have enough free space on the drive). This means that linux users can make and maintain an NTFS E2B USB drive. See ReadMe file in the linux_utils folder for more details. If you have several different DOS utilities (to flash a BIOS perhaps or run a DOS-based diagnostic) which are provided as .exe or .com files, then you may have trouble adding it to an NTFS E2B USB drive. Usually, you would have to make a DOS-bootable floppy disk image or perhaps make a bootable USB flash drive and then 'capture' the flash drive as a FAT32 .imgPTN file using the MPI Tool Kit (MakePartImage). Actually, E2B will try to boot to IO.sys or Kernel.sys, so you do not have to 'SYS' the floppy image, just ensure that the correct boot files are present inside the image file. Today, I found some DOS floppy disk images which contained NTFS drivers on a Russian site (www.bootdisk.com seems to not provide free downloads any more). This means that all you have to do, is copy your DOS utilities to a new folder on your NTFS E2B USB drive, boot to the floppy disk image and then run the DOS utility straight from the NTFS E2B drive. Note: The FreeDOS floppy image included with E2B v1.83+ now includes a DOS NTFS driver, so you can access an NTFS E2B USB drive as drive C:. Because FreeDOS is used and not MS-DOS 8.0 however, long filenames are not displayed correctly and so it is not quite as good as the DOS4NTFS.IMZ image. Whilst looking at the Aomei Backupper utility (horrible name!) in a previous blog, I saw the free Aomei One Key Recovery product on the Aomei website and decided to try it today. New grub4dos 0.4.6a 'E2B.cfg missing' bug fix + others. SDI_CHOCO (automated driver and apps install for Win 7/8/10) added. Support for WSUS Offline update in SDI_CHOCO added. New Win8/10 SDI_CHOCO XML files (+ some older XML files re-named). Fix for Windows Setup refusing to install to internal hard disk if using E2B HDD+WINHELPER flash drive combination, with some systems. Install from XP ISO hang/reset grub4dos bugfix. Small tweak to \_ISO\e2b\grub\menu.lst to remove extra screen clear. Improve LOADISO.cmd routine when searching for virtual Win7/8/10 ImDisk DVD drives. Added two new bootmgr versions to 'whitelist' for VHD booting. Download E2B v1.82, unpack to a new folder and then use the \UPDATE_E2B_DRIVE.cmd script to update your E2B drive. Note: I just noticed that the new version of grub4dos has a small bug. It soaks up key presses, so if you press Ctrl+U whilst the Main menu is loading, E2B does not go straight to the Utilities menu. You have to wait for the Main menu to display before you press Ctrl+U. Hopefully this will be fixed by the developers in the next version of grub4dos. P.S. Fixed in v1.83. I was interested in finding a free offline disk backup and restore utility that I could boot from E2B and quickly make a full 'bare-metal' disk backup or restore of any (Windows) system. I found a good article on a Raymond.cc blog post here, which tested 20 different backup utilities, but many were not free. I decided to quickly test some of these using a Windows 10, Lenovo IdeaPad 300 notebook containing an SSD internal drive (13GB of files) and booting from an E2B SSD in an Inateck FE2007 USB 3.0 drive caddy. Well, I didn't want to spend days using spinny-things and slow USB 2.0 drives, did I? My results tallied fairly well with the Raymond-site results (see the nice tables of free software further down this page). There is a live demo near the end of the video. Full automated Windows 10 install + a few drivers + Teamviewer in 12 minutes. Simple to set up the E2B drive. Once you have added the Driverpacks to your E2B drive, you can use E2B+SDI_CHOCO to install any version of Windows 7/8/10 Install ISOs. Just add the Windows ISOs and choose one of the ***SDI_CHOCO.XML files. 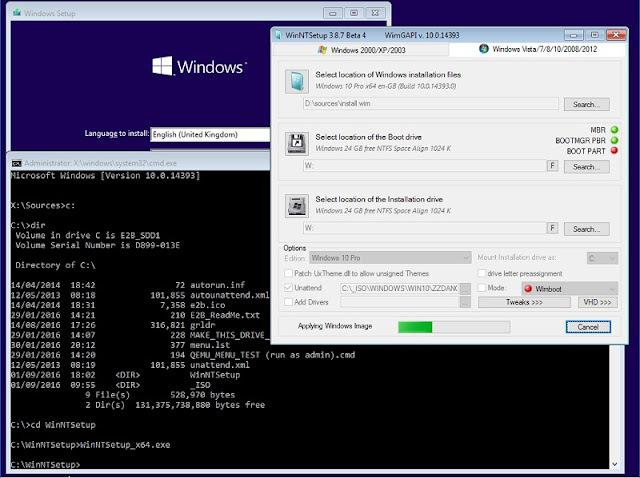 I have now added instructions to the E2B website on how you can automate a Windows 8.1/10 install using the SDI_CHOCO feature from a .imgPTN file. This means you can perform both an MBR or UEFI installation with an unattend.xml file and use the automated SDI driver installer + install apps using choco + add WSUS Offline updates automatically. If you have an E2B Removable drive, it is quite easy. Just add a \Unattend.xml file to the inside of the .imgPTN file. The XML file must contain a Specialize section which runs \e2b\Stage1.cmd (see the example XML files in the e2b folder for examples). 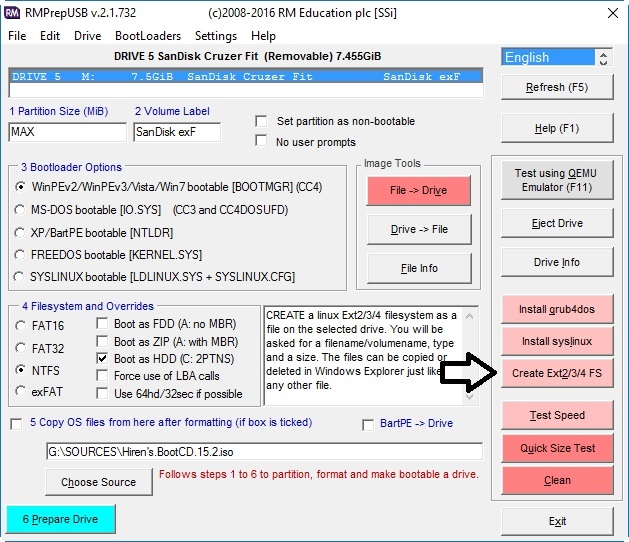 If your E2B USB drive is a fixed-disk (hard disk) USB drive, you will need to modify the boot.wim file (or simply add a small Removable Flash drive that contains the correct files - but don't use a WINHELPER flash drive or the XML file will be erased by E2B!). I have added the required files to the MPI Tool Kit v0.067 (Note: use the new version dated 2016-08-08, if you downloaded it yesterday, you may not have the \e2b\Stage1.cmd and Stage2.cmd files!). Using a .imgPTN file is tricky because once the E2B USB drive has switched to the .imgPTN partition image, the E2B partition (and all the SDI, DRIVERS, APPS, WSUS folders, etc.) are no longer accessible! 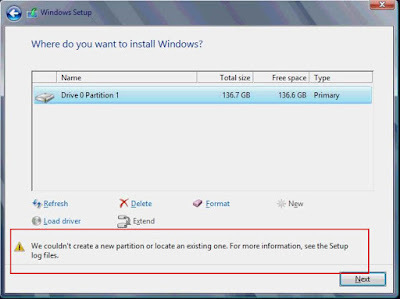 I get around this by automatically switching the partition back to the E2B partition when the Specialize phase is reached. Stage1.cmd is inside the .imgPTN partition and copies the files to the target hard disk, Stage2.cmd then runs from the target hard disk and switches back the E2B partition to allow access to the CHOCO_SDI folders. You can find the instructions at the bottom of this page. Note that the XML file needs to be named \Unattend.XML if it does NOT contain a WindowsPE configuration pass, or \AutoUnattend.xml if it does contain a WindowsPE pass. P.S. It seems the first release of the Windows 10 Anniversary install ISO has the same bug as the Windows 10 TH2 first release - internet access does not work in the Specialize pass! I fix this by running and then killing msoobe.exe. This sets up the network stack and host name correctly. Microsoft fixed this bug in the later TH2 versions, but they seem to have regressed when they released the Anniversary edition! If you want to install choco apps in the Specialize pass, then you will need internet access. If you only install choco apps using MyStartup.cmd, then you can add a NoInternet.tag file to prevent SDI_CHOCO from trying to run msoobe to fix the internet connectivity. The MPI Tool Kit now supports a MyCSM.cfg menu configuration file, so that you can use the E2B_Editor GUI utility to design your own custom CSM menu. It also supports GFXBoot menus. You can add files to the CUSTOM folder in the MPI Tool Kit and any .imgPTN file you make in future will have your custom menu. For instructions, see here. Download from the Alternate Download Areas. Sample MyCSM.cfg file with (nasty-but-small-file-size) pink jpeg wallpaper. Also, E2B 1.82h Beta is released. It includes the latest grub4dos 0.4.6a which has three bugfixes and SDI_CHOCO. This is a 'release candidate' and will be fully released as the official v1.82 in a few days - please try it and feedback if you find any issues. SDI_CHOCO allows you to easily completely automate the installation of Windows 8.1 or 10 using an unaltered Microsoft Install ISO and automatically install drivers, Windows Updates and applications. P.S. If you have previously donated or contributed in other ways to E2B and don't like the new Easy2Boot website page format (and all the ads! ), please contact me for a way to get the original www.easy2boot.com site layout. www.nomoreransom.org looks like a useful anti-ransomware site where you can find decryption tools, information and advice. The “No-More-Ransom” website is an initiative by the National High Tech Crime Unit of the Netherlands’ police, Europol’s European Cybercrime Centre and two cyber security companies – Kaspersky Lab and Intel Security – with the goal to help victims of ransomware retrieve their encrypted data without having to pay the criminals. Upgrading Win7 to Win10 still works! + weird 'Unable to install Windows to the hard disk' issue solved. I was playing around with PSUs yesterday and temporarily 'borrowed' the PSU from my old Dell Inspiron 530 to test it with another system. 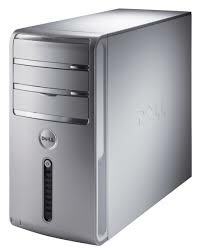 After confirming that it worked on the other system, I replaced it back in the Dell 530 when I realised that the 250GB hard disk in the Dell was actually running Windows 7 (the Dell was originally installed with Vista, but I later installed Windows 7 Ultimate many years ago using a Retail product key). I decided this would be a good chance to see if the Windows 10 Upgrade offer was still working, so I booted from my E2B drive (an Inateck FE2007) to a Windows 10 Pro TH2 VHD, typed in the Windows 7 Product Key (which I had obtained using ShowKeyPlus previously) - and voila! I had one activated Windows 10 Pro system. So as of 2016-08-05, I can confirm that you can still use a Win7 retail product key to activate Windows 10. I decided to do a fresh install of Windows 10 from an ISO file using my E2B hard disk (FE2007 + Samsung SSD) and a 'Helper' USB flash drive. As you may know, if E2B is on a hard disk, we need to add a Removable USB drive so that Windows will 'pick up' the AutoUnattend.xml file from the Removable drive during Setup and that we can make ImDisk run and load the ISO as a virtual DVD drive. The FE2007 hard disk enclosure has three USB 3.0 ports built in, so the flash drive is always connected to the E2B hard disk. So, I booted to E2B and selected the Windows 10 ISO (actually the latest 'Anniversary' version) and got to the Disk\Partition selection screen as usual. 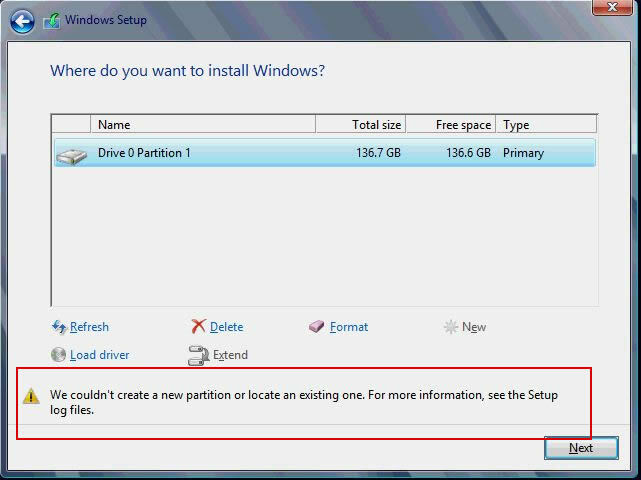 BUT I then got stuck on a problem - Setup refused to install Windows onto the internal hard disk! Every time I got the message: 'We couldn't create a new partition or locate an existing partition'.